Over the summer, the Information Services team launched a $1 million project to overhaul Spring Arbor University’s (SAU) Wi-Fi network. Completely funded by the Information Services budget, this network rebuild replaces every Wi-Fi box on campus and more than doubles the number of access points on campus. This means Wi-Fi signals should range farther and be stronger across campus. The dorms’ boxes have already been replaced, and some are in rooms instead of in the halls. The rest of the residences should have the new Wi-Fi installed by the middle of October. New Wi-Fi boxes installed inside dorm rooms. The Information Services team, led by Chris Blackstone, hired a third party to conduct a complete survey of campus to find the worst Wi-Fi spots in June. Now there are extra wireless adapters focused on those areas, as well as high-traffic spots like the volleyball courts and the oak tree. The next steps include finishing the villages and apartments and the administration buildings on campus. All of the buildings on campus and at other university sites should be done by Thanksgiving. If anyone has issues with the Wi-Fi, Information Services wants to know, Blackstone said. Now it is easy to submit issues or suggestions through the new self-service portal. Wondering when your apartment or building will have new Wi-Fi? The My Support portal has a page dedicated to keeping everyone up-to-date on projects like the network rebuild. Look for the link soon on the SAU App. What the MySupport link looks like on the mySAU portal homepage. The new portal also includes how-to articles so students can find answers to accessing their email quarantine, adding their email to their phone or connecting dorm printers to their laptops. 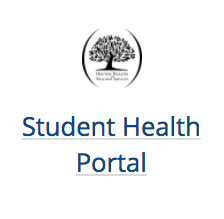 The new Student Health Portal available on the mySAU homepage. Information Services created it over the summer so students can schedule appointments, submit paperwork and more. “When people are able to answer their own questions, they’ll get to an answer a lot more quickly than when they have to wait for us,” Blackstone said. Later this fall, students, faculty and staff will have to log in to the Wi-Fi once to access Wi-Fi. Adding authentication allows the Information Services team to give more bandwidth (faster connection) to those staying on campus while the guest Wi-Fi has less bandwidth and access. The entire campus also now has one full gigabyte of bandwidth. The Information Services team has a lot of projects in the pipeline this year. They have already launched a health portal where students can schedule appointments at the Holton Health Center. Later this fall the team will be rolling out a new mobile-friendly version of the portal as well. Blackstone’s professional background is in digital marketing and the web, so he wants to make sure tools are built for mobile. If anyone has any Wi-Fi or computer questions, submit a ticket on the new portal or see the Information Services office in the lower level of Deitzman Hall across from Gainey.